Starting on Tuesday, September 25th, 2018, one of the rarest and most exceptional properties I have seen in Honolulu is going to be auctioned online by Concierge Auctions. Luakaha Mauka Estate, a family home, was built in 1903 and sits on 2.4 acres with a 50-foot natural waterfall in the backyard. I had the pleasure of viewing the property yesterday, and I can’t stop thinking about how wonderful it would be to actually reside there. You could be that lucky person, come next Tuesday when the auction opens for bids. 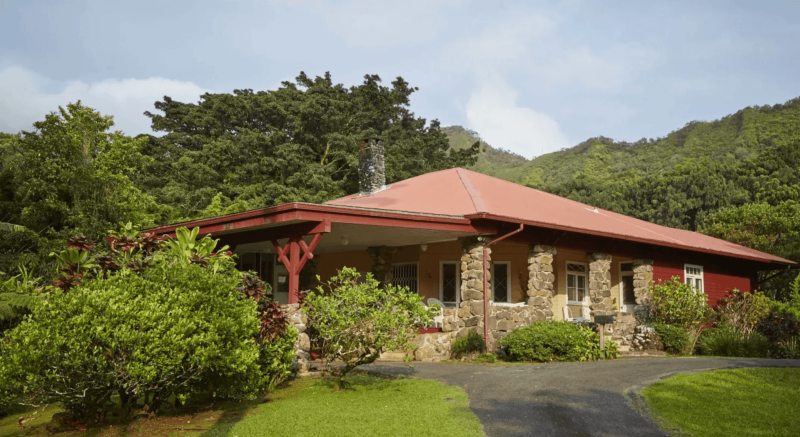 The home is located on the jungly Nuuanu Pali Drive which is lined with bamboo, old world forkedfern, ‘ohi’a lehua, and loulu palms, all indigenous to Hawaii. When you come up the drive, the native plants carry on from the street and create a beautiful feeling that you are living in a botanical garden. This 4 bedroom, 3 full bath, 2,696 square foot home looks down at the most majestic waterfall you can imagine. Listen to the water as it billows off the rocks and into the pool from the large sitting room lined with windows and panoramic views of the never-ending dense forest. Take a waterfall swim or hike in the afternoon, or head to the ocean which is only 20 minutes away. This property offers endless ways to relax and enjoy a private lifestyle. The land adjacent to this property was King Kamehameha III’s retreat and has been in the same family for five generations. This is the first time that this property has been available for the public to buy, a once-in-a-lifetime opportunity. 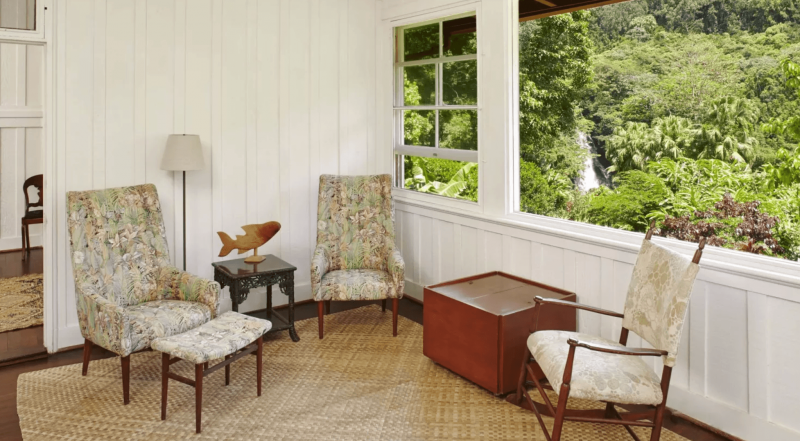 The home offers dark hardwood floors, extra high ceilings, and a completely open layout with the classic Hawaiiana old world charm in every room. The lovely large lanai was one of my favorite features, and I can imagine entertaining guests or curling up with a good book. Previously offered for $7.5M by Hawaii Life, the property will be auctioned next Tuesday, the 25th through Friday, the 28th. There is an opportunity to own the surrounding land parcels as well. If you are interested in owning this unique property, the auction, or want a private showing before the auction starts, please contact me. This is truly a luxurious hale and a chance to own a property unlike anything on Oahu.